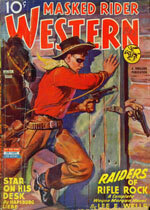 Masked Rider Western | Established in 1934 | Thrilling | Edited by Eugene A. Clancy | Total Issues: 100. 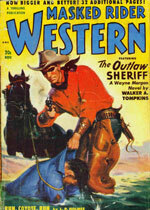 For a brief history of the magazine, click here. According to US Copyright law (Title 17, US Code), these items are now in the Public Domain, since their original copyright registrations have expired or were not renewed after 28 years (Pub. Law 60-349, Sec. 23). In countries outside the United States, however, copyright restrictions may still apply. Exceptions may include contributions, registered at the time of publication, but renewed individually by the authors' estates. If you or anyone you know owns the copyright to any of the materials included here, please contact us.